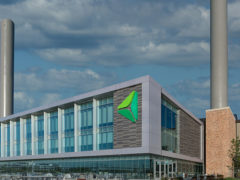 ProMedica’s new headquarters is much more than a state-of-the-art workplace for over 1,000 administrative employees. For the Toledo community, the renovation of two very different landmarks is a symbol of rebirth for the downtown area and a catalyst for future development. Historical preservation and extensive renovations of the historic Steam Plant and a construction of a three-story, glassed-in addition facing the riverfront. An interior renovation of the Junction building, formerly known as the KeyBank building. A six-story, above-grade pre-cast parking depot with 646 parking spaces, one story below grade with 127 parking spaces and a 5,000-square-foot tenant suite. The project created a contemporary, four-story headquarters within the Steam Plant’s single-story, structurally delicate shell. Work was meticulously planned, phased and sequenced to ensure the safety of workers and the 19th century building’s structural integrity. Key historic elements of the Steam Plant were carefully preserved or duplicated. Constructed in the late 1970s, the five-story, triangular Junction building appears to hover in the air. The Junction was redesigned to create an open office layout for ProMedica on the top three floors, two ground-floor restaurants and a basement YMCA. Rudolph Libbe and GEM Inc.’s own craftspeople performed selected demolition, concrete foundations and slabs on the Steam Plant; cast-in-place concrete in the parking depot; and structural steel, as well as mechanical in the Steam Plant and Junction buildings. GEM Energy’s HVAC team maintains both the Steam Plant and Junction building’s heating and cooling systems. You’ll find the RLG team to be customer-focused and go to great lengths to deliver a quality project. We are proud of our new facility and the work we accomplished with RLG.